So we finally got around to playing one of the old German classics, Heimlich & Co., which is one of those ludicrously simple games that relies entirely on your ability to bluff the other players. And rather good it is, too. However, I’m always a bit nervous about playing games that involve having to keep secrets with Miss B, as it’s not something that comes naturally to a five-year-old. …And so it turned out to be. We got a couple of turns into the game and hit the first round of scoring when Miss B inadvertently said “..and I score five”, instantly blowing the secret out of the water. That was not good for morale, so we agreed to start the game again now we had had a practice run and knew what it was all about. Good. That worked. We got quite a bit further in the next game before things went wrong. Again the identity of Miss B’s agent slipped out, but this time she was quite a long way ahead of me and I managed to convince her that it was OK and we’d carry on and see if she could guess what my colour was. From here on my play style got a bit cavalier, but by now the aim of the game was to finish with both of us managing to smile, rather than for us to have a good gaming contest. We just about succeeded on this front. I still think this is a very good game (and I love that the pieces are so huge and chunky), but it’s not one that we’ll be playing together for a while, and it provides an object lesson to us. 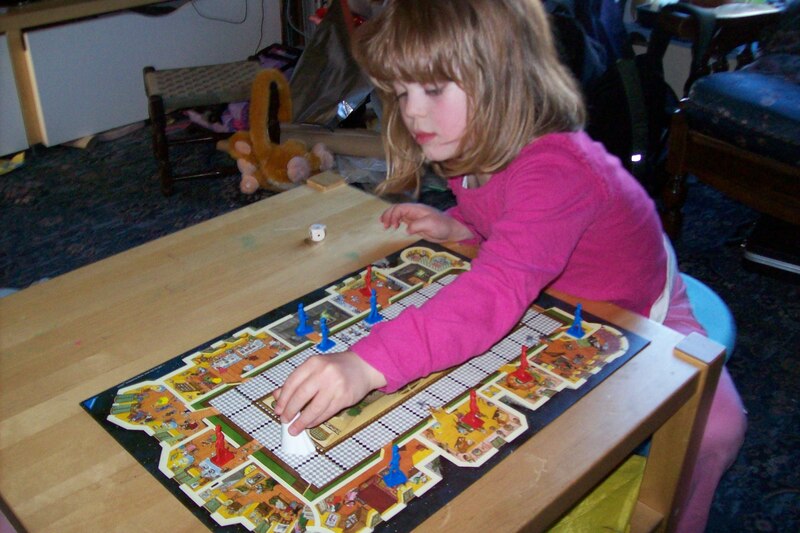 While Miss B has shown herself to be very capable of keeping a secret in a game (remember Lords of Waterdeep? ), where the secret keeping is almost the entire game, the pressure is just too much. Maybe we’ll try again in a couple of years or so. The game: Heimlich & Co. (Ravensburger), 2 to 7 players aged 8+. El Grande is certainly one of my all-time favourite games. With four or five players it provides a quick moving, deep tactical game which really set the standards for area-control Euro games. It’s rather less good with two players, but it’s still OK and as there isn’t any real hidden information in the game, I figured Miss B could probably handle it. Oh, and my copy is in German. This really doesn’t matter though as it just requires reading out the translations of the action cards once each turn, and the illustrations on these cards are generally very useful for demonstrating what they do. Due to it being many years since I last played El Grande and my failure to read the rules properly, I made a bit of a mistake over where you can place your men on the board. When I remembered the mistake we had a discussion and decided to carry on as we were. The mistake just made it easier to place men, removing a degree of potential frustration, though also getting rid of much of the tactical play. For a first play with a 5-year-old that sounds in retrospect like a good thing, so I’ll pretend here that I intentionally decided that caballeros can be placed anywhere and not just adjacent to the king and would you please disregard the rest of this paragraph. The game went remarkably well. El Grande really isn’t much of a two-player game (though there are some tweaks that can improve it) but it’s not a bad way to spend some time. 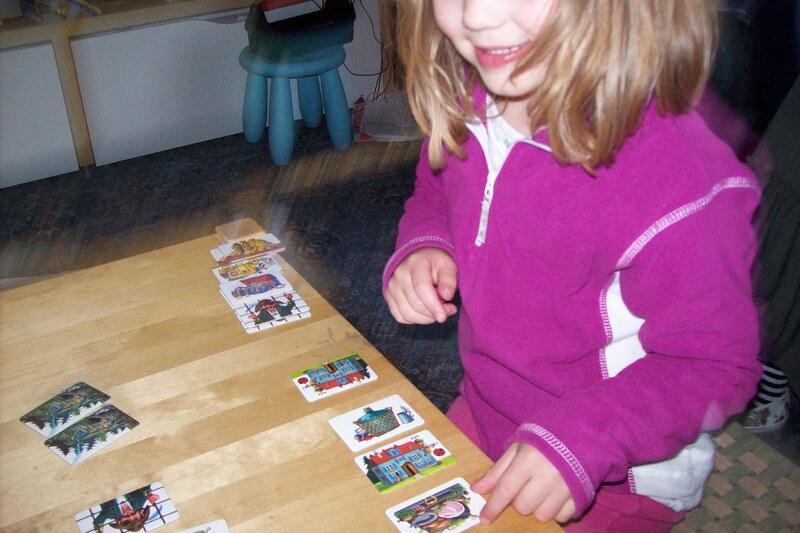 Miss B got to grips with the basic province-to-court and court-to-board mechanism to move the caballeros, and was happy with the action cards too. I needed to remind her of things from time to time, but that’s normal: most card games involve regular reminders for her to draw a card. During play I challenged Miss B for a couple of regions so there would be a bit of a feel of competition, but we mostly pottered along on our own. Overall I felt things went really well, though it’ll be a while before we have a competitive game. Next time we play (and I’m pretty sure there will be a next time) we’ll play the proper placement rule and probably just play a six-turn game (another thing I didn’t think about in advance). Then hopefully we’ll be able to play with more people one day. The verdict from Miss B (aged 5½): “It was good. I liked it because I learnt new words… like Koenig.” Ah, gaming plus German lesson all in one. Sometimes I miss the time when so many of these great games weren’t available in English. 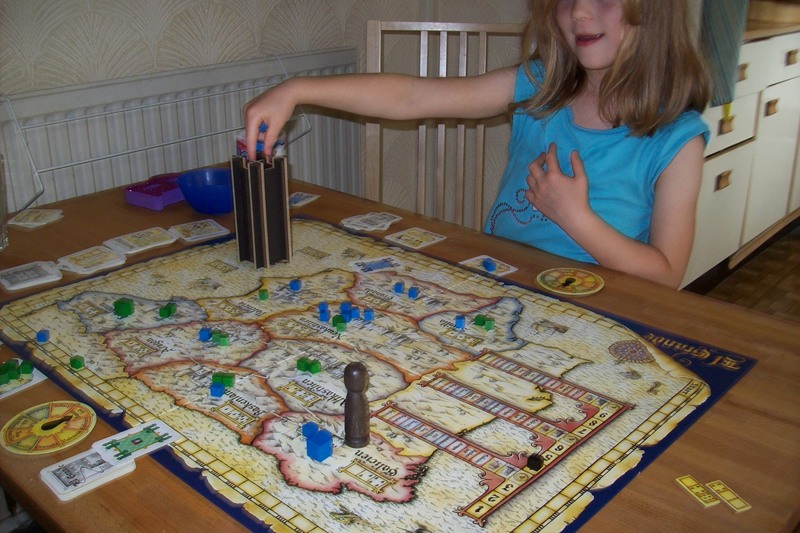 The game: El Grande (Hans In Glueck), 2 to 5 players aged 12+. Four pairs of horses, three piles of food, two bags of gold and a highwayman! Another game of varying names, we have Highwayman, which is also known as Stake Your Claim, a name which I think fits the artwork (and gameplay) rather better. You have piles of treasure and other goodies which you try to claim either from the middle or by stealing from other players. Not entirely ethical, but fun for a quick game. The rules we have suggest two different variant games. The two-player version seems a bit trivial to me, so we went with the standard game, the only tweak being that Miss B had her hand of cards on the table as she found it a bit tricky to hold them. Incidentally, we have developed a fun way of counting up scores in our games where you see who has collected the most treasures. We discard our treasures together, one at a time, counting as we do so. 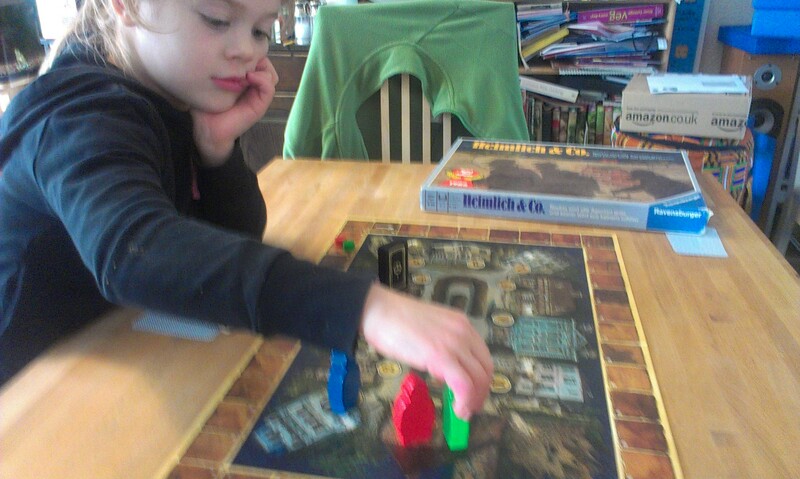 Eventually one of us runs out of treasure and the other is the winner (having completed the count, of course). The verdict from Miss B (aged 4¼ and a bit): “I liked it. It was gooder than the others. Because it was good when we took things and then stole them back.” I think we may need to have a discussion about property and theft. The game: Highwayman (Ravensburger), 2 to 6 players, age 6+. Well, Mummy was willing to give it a go, so off we went with three players this time. Miss B thoroughly enjoyed dividing up the people and explaining the game to Mummy (missing out only the rules!) and soon we were playing. As is inevitable, Hugo got to move a lot more between our turns and Miss B was getting really excited as people got caught and sent downstairs. This one is definitely cemented as a favourite, but I think it’ll be a little while before we introduce the proper scoring. More positives: Miss B wasn’t losing track of which colour her pieces were this time, and the whole moving clockwise thing was pretty well bedded in. The verdict from Miss B (aged 4¼): “Good. I liked that we all played together and I won.” Yeah, don’t rub it in, kid, you just had some lucky rolls. It seems that the social aspect is pretty important though, with all of us playing being a major selling point. The game: Ghost Party (Ravensberger), 2 to 8 players, age 8+. Our version is called Ghost Party, but other folks have Midnight Party. It’s all the same, give or take a rebranding or two. Either way this used to be a popular little game towards the end of a long evening of gaming, or as an intermission between a couple of more serious games. One of those “not just for kids” things. There are a few like that in the Ravensberger range. We simplified the game a little by not requiring exact numbers to enter the “bonus” rooms and simply not bothering with the scoring: the winner was the person with the least people captured by Hugo. Two rounds of this and we won one each, which seems fair. As expected, the major exciting points of the game were when Hugo moved and grobbled people. In our second game, we went a very long time before Hugo even progressed from the bottom step and Miss B theorised that he was having a rest. So we made our people walk past the top of the stairs taunting him, “Nur nur, you can’t catch us!” That seemed to do the trick. For some reason Miss B also kept forgetting which colour people she was playing, and occasionally we had space counting issues, but otherwise it all went fairly smoothly. I think, however, this would have been a lot more fun with more than just the two of us. Next time we will rope in Mummy. The verdict from Miss B (aged 4¼): “I liked it because I loved the bit with people chasing around. I liked the bit when Hugo getted my four blue ones.” Rose tinted hindsight there — there were almost tears at the time! Ha! You can’t move your spider now!